Ho, ho, ho! It's me, your Secret Santa. Here's a gift I picked out especially for you. How do I know your tastes so well, you ask? Well, we are office mates, after all. But you won't get any more information than that - at least not yet. I was so excited when I drew your name. I knew it would be a challenge to outwit you, but I am up for the task! I hope to keep you guessing from now until the mystery is revealed. In the meantime, watch for clues. 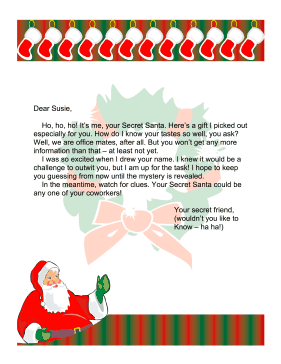 Your Secret Santa could be any one of your coworkers!